The wins of Orb in the Kentucky Derby (gr. I) and Princess of Sylmar in the Kentucky Oaks (gr. I) further solidified the pensioned Lane's End stallion A.P. Indy as the premier sire line source of classic speed in the North American Thoroughbred. Indeed, with Normandy Invasion (by Tapit (TrueNicks,SRO)), Dreaming of Julia, and Revolutionary (out of an A.P. Indy mare) all running well in their respective races, one can see that in years to come inbreeding to A.P. Indy could easily become as prominent a method of upgrading for classic speed as inbreeding to Mr. Prospector is today. What Craig alluded to in his tweet, and what we at TrueNicks are very aware of, is the measure of opportunity. The TrueNicks algorithm itself is built on a proper assessment of opportunity in order to gauge just how well the mating at hand is performing. When it comes to stallions, however, how well do we measure opportunity? For those not familiar with the terminology, here is a rundown of the more prominent measures of stallions in the industry. Average Earnings Index (AEI): indicates how much purse money the progeny of one sire has earned, on average, in relation to the average earnings of all runners in the same years. The average earnings of all runners in any year is represented by an index of 1.00, so a stallion with an AEI of 2.00 is twice the average, etc. Comparable Index (CI): indicates the average earnings of progeny produced from mares bred to one sire when these same mares were bred to all other sires. Only 32% of all sires have a lifetime AEI higher than their mares' CI, and the comparison of the two is an often-used measure of stallion performance. Annual Progeny Earnings Index (APEX): a series of indexes developed by Bill Oppenheim. The signature index, which is called the "A Runner Index", began life as an attempt to modify the impact of one huge earner on a sire's cumulative AEI. It does this by measuring the frequency with which a sire's runners reach the top two percent of earners, each year. The calculations and analyses are restricted to the last seven years. By his own admission, Bill does this because he doesn't want to let once-great stallions live entirely on past glories. So lets take a look at A.P. Indy and his sire line with these figures. It shouldn't take readers of this blog long to work out a few problems with these numbers! Let's start with the now-retired patriarch A.P. Indy. His APEX rating is one of the best in the world and he continues to produce outstanding runners, mainly over two turns in North America. His AEI is also high but it is less than his CI, indicating at face value, that he is degrading the mares that are bred to him! How is that possible? Well, here is where a problem with the CI is quickly exposed. This rating makes no allowance for the quality of the stallions that were bred to in creating the CI. In A.P. Indy's case, some of the mares that were bred to him had their best foals early in their career by other stallions and then were "upgraded" to A.P. Indy's book for a commercial mating. Additionally, mares that were often bred to A.P. Indy, and may have produced a superior runner by him, were also sent to other premier sires at the time who may have also sired a superior runner out of that mare. These types of commercial assortative matings is what fuels a high CI. The fallacy of the AEI/CI comparison is magnified in the case of Bernardini (TrueNicks,SRO). Here is a young sire whose APEX and AEI ratings place him as a superior sire, but whose CI—a massive 3.12—would indicate that he is downgrading his mares (they are doing better with other stallions). In Bernardini's defense, as was the case with Mineshaft (TrueNicks,SRO) when he retired to stud, the mares that have generated this CI have been bred to sires where the runner that is creating the CI may well have been the best foal that the mare ever had prior to being bred to Bernardini. At a certain point it is almost impossible for a young stallion to jump over the CI created by his mates having previous success with quality stallions and be seen to be improving his mares—that is unless this CI is modified to reflect the quality of the stallions that created the CI in the first place. If you haven't noticed already, the APEX rating doesn't have a comparable index so there is no way to tell if the stallion is in fact doing better or worse than the opportunity afforded to him using a comparative measure. The AEI/CI comparison does highlight the performances of Tapit, Flatter (TrueNicks,SRO), and Jump Start (TrueNicks,SRO) at stud, with all three of these stallions, in addition to Malibu Moon, "upgrading" the mares that were bred to them. So what then do we make of Lucky Pulpit (TrueNicks,SRO), standing at Harris Farms in California for just $2,500 this year? By both the APEX ratings and AEI/CI comparison, this son of Pulpit is an elite stallion, however his ratings may expose the issues with using earnings, as APEX and the AEI/CI do, to measure racing class. Lucky Pulpit, with a small number of foals of racing age, looks to be benefiting somewhat from the restricted California-bred purses, where his runners are able to earn significant funds in restricted racing and generate high APEX and AEI scores. That said, he still has to do it, so at some level the numbers show that Lucky Pulpit may well be an undervalued sire in California. So we have established that in order to really measure a stallion's opportunity, a comparable index is required, but in order to make it valid, the biases of the quality of the stallions that generated the CI needs to be accounted for (and quite possibly the foal rank of the foal). This would establish the individual stallion's merit, but then what about comparing the ratings of one stallion to another? Going right back to the work of Joseph Estes, the former editor of The Blood-Horse, creator of the AEI, and considered the doyen of statistical evaluation of stallions, the racing class of the racemare is paramount to the success not only of the mare at stud, but also the stallions that she is bred to. That is, on average, better class racemares will breed a better class runner, all other things being equal. This is why APEX rating comparisons such as between Malibu Moon (2.18) and Pulpit (2.25) are intellectually flawed. The racing quality of mare is significantly different between these two sires. While Pulpit received some good racemares in his first years at stud at Claiborne, Malibu Moon, as Craig Bernick indicated, received some very average racemares. Thus, the performance of Malibu Moon in comparison to other stallions is significantly better than his 2.18 would indicate, as the APEX rating makes no allowance for the racing class of the mares bred. Taking out all the influences of both the racing class and the production class of the mares bred to a stallion would create a figure that would represent a true genetic improvement index for stallions. 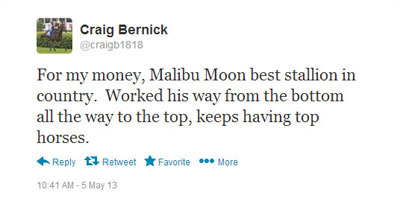 While this is yet to be achieved, it can be said at face value that, given the quality of mares that he has covered and their performance as both racehorses and producers, when compared to his peers Malibu Moon may well be, as Craig Bernick suggests, the best sire in North America.